Gay Men’s Health Crisis (GHMC) opened a new legal services program this week in Queens in cooperation with Queens Pride House and the City University of New York School of Law. The clinic, named GMHC@Queens Pride House, is positioned to help the borough’s under-served communities. The Woodside-based clinic, which offers a variety of services, specializes in providing free legal assistance for people living with “a triple whammy,” according to Ana Oliveira, executive director of GMHC. The clinic is staffed with a paralegal, an intern from the CUNY Law School, and an attorney from GMHC’s Legal Services and Client Advocacy. The program provides legal assistance for a wide variety of services, including immigrant cases, discrimination cases, landlord/tenant issues, estate planning, and family law. The location at 67-03 Woodside Avenue will serve the large, immigrant LGBT population in Woodside, Corona, and Jackson Heights. Translators of Spanish, Chinese, and other foreign languages are provided for clients. Funding for these free services comes from GMHC, the nation’s first AIDS services association, and the Stonewall Community Foundation, an LGBT advocacy organization. In addition to on-site legal assistance, the program anticipates working with other local organizations, such as AIDS Center Queens County and Safe Haven, in providing services in Queens through cooperation and referrals. The legal clinic at Queens Pride House is open Fridays from 10 a.m. to 5 p.m. 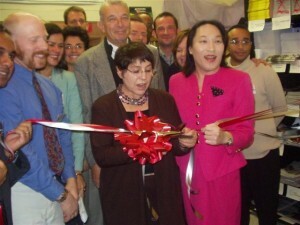 Call 718.651.4945 or 212.367.1040 or visit www.queenspridehouse.org or www.gmhc.org. This article originally appeared in the 1-7 November 2002 issue of Gay City News.